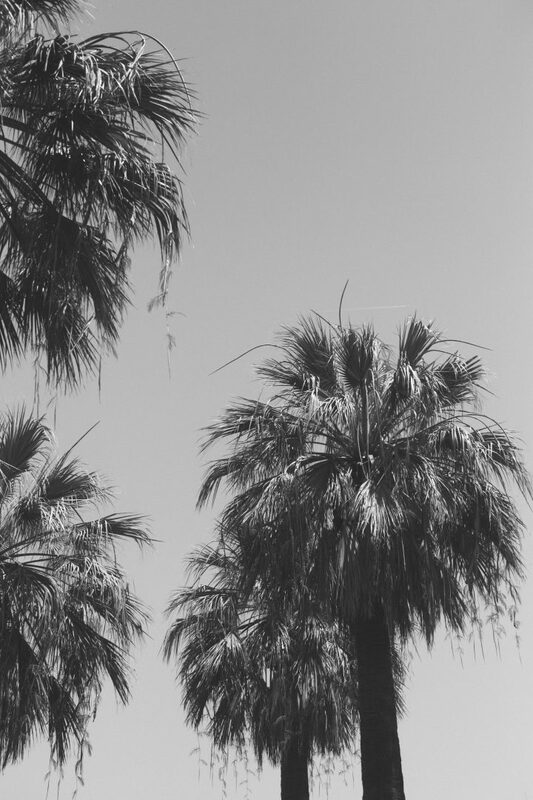 Today’s label to watch is the Berlin based bag label AGNEEL. If I had to describe Yesim Karaman’s label in three words it would be minimal, elegant and timeless. But what I love even more about AGNEEL is the mission to make the modern woman’s life easier. A woman that goes to the office in the morning, meets clients during the day and goes for a after work drink with her girlfriends and while doing so doesn’t have to worry about her bag not fitting to the occasion. 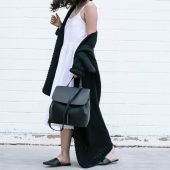 I have always wanted a classic black bucket bag but there was always something that bothered me – may it be the golden hardware, the size or the texture of the leather. 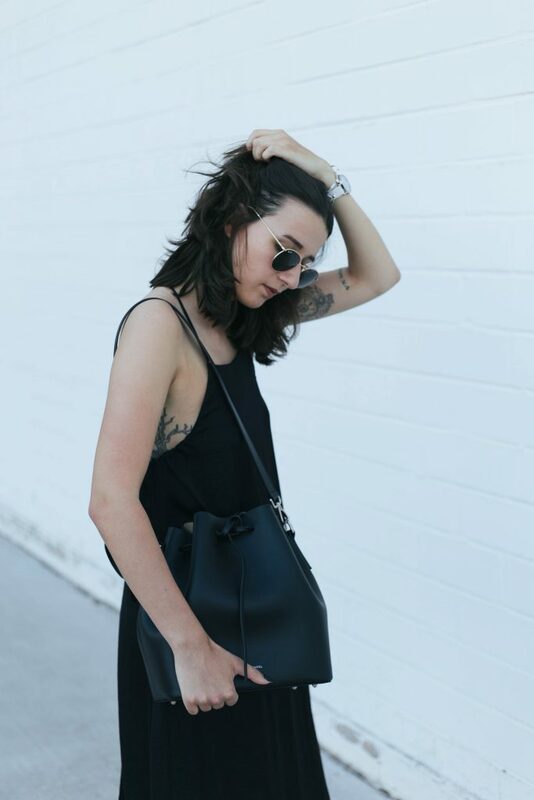 The Alessa bucket bag comes in three different leather textures; normal, structured and suede and trust me all of them look and feel amazing – the leather is thick and super soft! 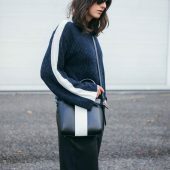 When I unpacked the bag for the very first time the smell of fresh leather was the first thing I noticed as well as the sleek and soft texture of the bag. When I continued to look inside the bag I could feel the cappuccino colored suede leather and the little stamped AGNEEL branding. As a lover of details I was head over heels from the very first moment onwards. The bag hast the perfect size to fit my camera as well as a small waterbottle and it comes with a small leather pouch to put my keys and other small things in. Another detail to love are the two different handles one long handle and one shorter handle – perfect for every occasion. Finally, I can stop the desperate search for my perfect bucket bag! this dress is incredible! Love the back details! Omg! The dress is so pretty! Love the bag! U look fashion forward! Ohh vielen vielen Dank Amely Rose <3 Hab mich so über deine Worte gefreut! Thank you lily x yes it does! Richtig schöner Look! Ich dachte erst, ich hätte was an den Augen, aber das eine Bild bewegt sich ja wirklich, haha! Hehe 😉 Ja ein kleines extra! The bag is actually perfect! I love it! 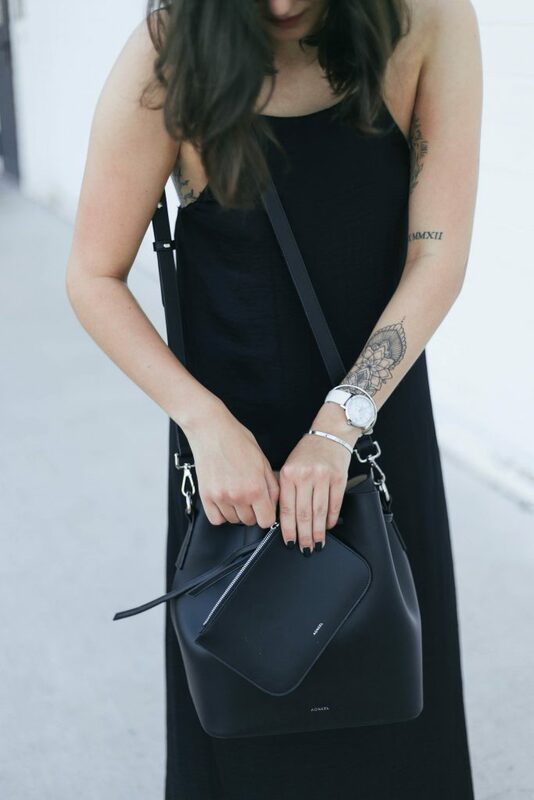 Ich finde Bucket Bags generell klasse. Aber das Kleid ist wirklich perfekt, das Rückendetail und der Schnitt 1A! Was für ein wunderschönes Kleid – und die Bucket ist wirklich der Hammer, tolles Label! 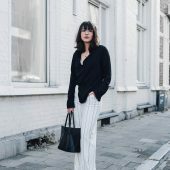 Wow die Tasche sieht wirklich sehr schön aus! Aber auch die Slipper sind super schön, LOVE IT! 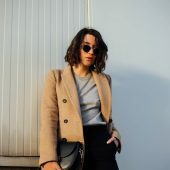 I am so lucky I found your blog, your style is just stunning. Loving your tattoos too! Vielen lieben Dank Jana <3 Ja das Maxikleid habe ich mir diesen Sommer endlich kürzen lassen & trage es jetzt nonstop! Das Kleid sieht ja toll aus, sehr schöner Look! Das Kleid ist tatsächlich einfach perfekt! Und bestimmt herrlich zu tragen an heißen Sommertagen! Toller Minimal-Look! Das Kleid gefällt mir sehr gut. Das Label kannte ich noch gar nicht, werde ich mir aber mal anschauen. I can definitely see why this is a label to watch! 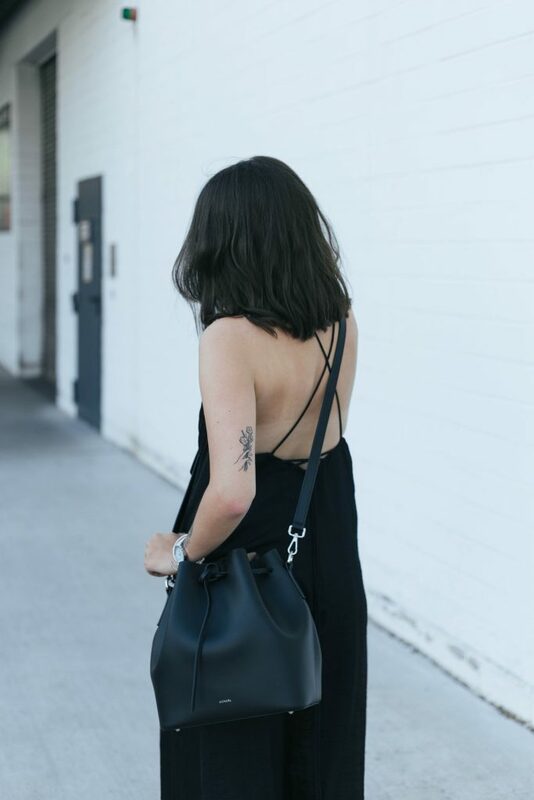 Loving the back detail of your dress with the bucket bag and slides. Beautiful outfit dear! 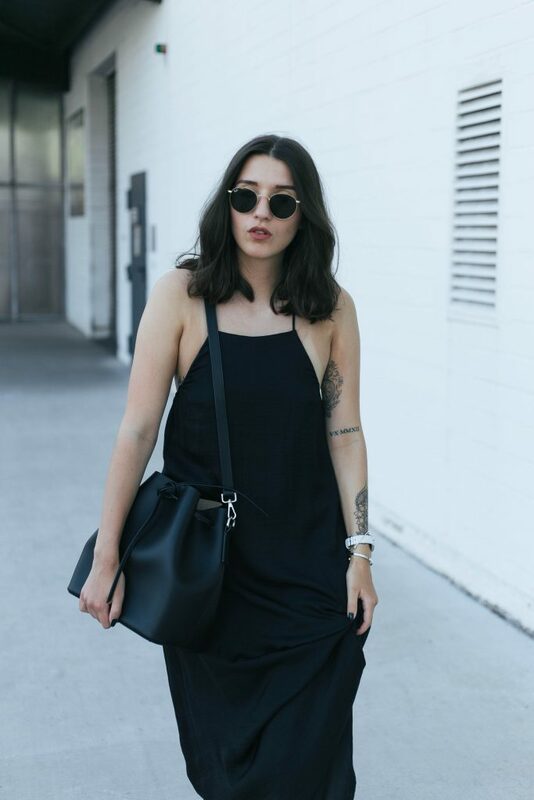 Amazing total black! 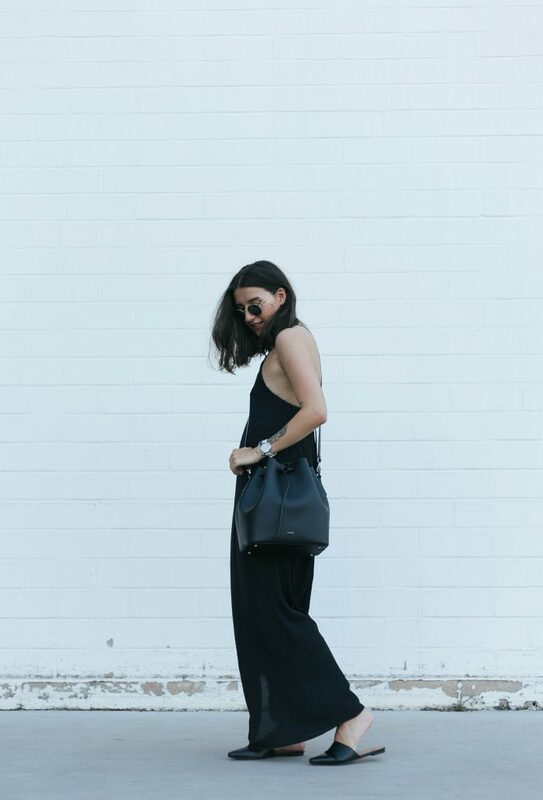 Such an elegant and effortless look with the long length and mules! love this look! 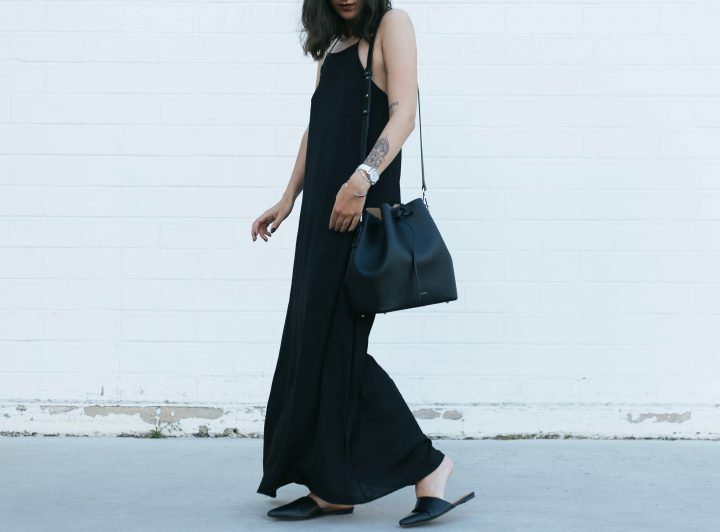 the shoes and the dress are effortlessly cool! also really adore your tattoo! Das Kleid ist ein Traum! Der ganze Look gefällt mir wahnsinnig gut und steht dir einfach nur perfekt! Looking gorgeous, babe! love the bag! 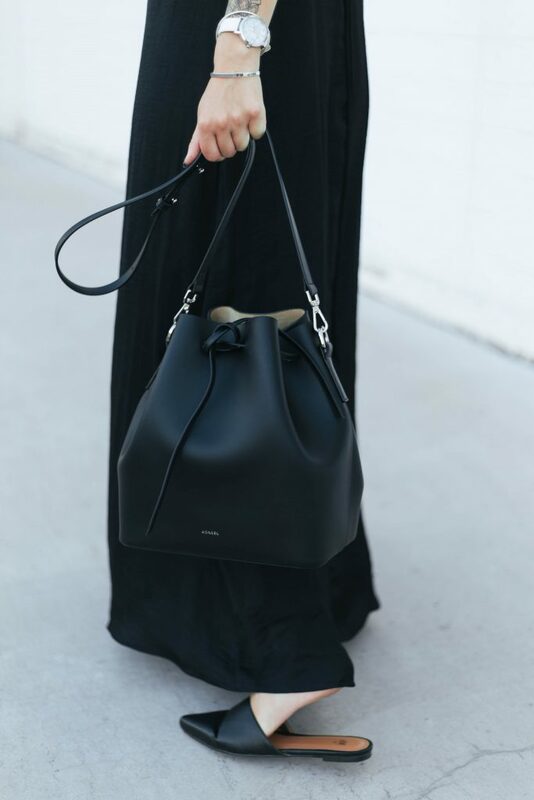 Love the look of black with the dark blue bag! Refreshing change!